My guess is that #2 is the Tecsun PL-660, known for its bad agc when signals are low. I think #1 was the best overall. 73’s from Holland! For listening my order is number 2, then number 1 and then a fair way behind those number 3. Number 1 had better AGC but number 2 had much more pleasant tone. I have no idea which one is the Tecsun PL-660 but I’m hoping it isn’t number 3 because I’ve already ordered one and it hasn’t arrived yet LOL. I liked number 1, Then 2 and 3 is pretty bad to me. I don’t mind the muffled audio in 1 due to the fact I usually use headphones or earbuds. I liked sample 2 the best. 1) Sample 1 – The Best – I think it is from Tecsun PL-660 ? 2) Sample 2 – It’s Ok – I think it is from Sony ICF SW7600GR ? Recording #1 does it for me. Very clear with very little effort to listen. #2 had too much fade or QSB. #3 was practically in the noise. I prefer 2 and then 1. 1, 2, and 3. Easy call for me. Sample 1 is the best. Maybe not so clear, but without the horrible up and down fading of sample 2 and 3, this means a good AGC. First why are there 3 clips and 4 radios? Second #3 is the Sangean and it doesn’t even get an honorable mention. It’s a toss up between 1 & 2. I like the more consistent volume of #1 and prefer it over the clearer but constantly changing volume of number 2. I don’t think #3 is the Sangean, it sounds like something else when it fades. I think #2 might be the Sangean, as it’s AGC sounds very similar to my 909. #1 has A very good AGC, (and it sounds auful), so this one is not the Sangean. One of the four radios was significantly less sensitive than the other three. I mention in the post that I didn’t even bother including it. I think # 1 then #2 and 3 comes in last. It was a hard choice between 1 and 2, i liked both of them. This is like the blind Coke vs Pepsi test. I hope I picked Coke. Sample 2 is clear cut winner. Close second is Sample 1. Sample 2 seemed best, closely followed by Sample 1, then the third sample. OK, I liked #2 audio quality, so it will be my first choice. #1 has far better AGC, but poor audio. 1. polish off the colour from the black screw to make it conduct. 2. isolate the speaker positive terminal of the speaker with heat shrink tube, as it touches the antenna’s pin on the pcb. tested it outside, now it works perfect on all bands. 1 had less fading and was easy to listen to, thanks for the comparison. 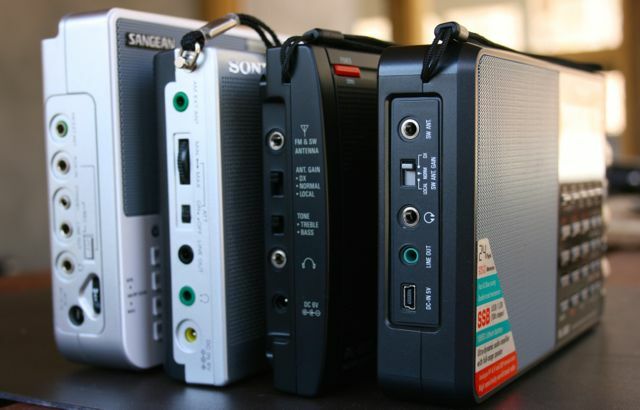 – but my personal test results have been Sangean 909 Radio Labs radio is superior to the others, Sony icf7600 is easiest to listen to (w/ great battery life unlike to Sangean), with Tecsuns just hard on the ears even if they are sensitive. I’ve only borrowed the Tecsuns (660 and 880) since I’m not impressed with the build quality and total engineering quality versus the Sangean and Sony). I prefer 1, then 2 and 3. #2 must be the Tecsun PL-660, I recognize the muting of high audio frequencies at low signal levels (a “feature” I disabled on my unit). 1 seems to be the clearest followed closely by 2 which has slightly more background noise. 3 is the worst on account of the harsh background noise. It’s nice of you to do these tests and I’m really curious which radio is which. I think I like #1 best by a fairly long shot. I think #2 is fairly far behind, followed not-so-closely by #3. On #2 it seems like the IF/audio bandwidth is being constricted on the ultra-weak parts. #3 seems to have some digital-type noise when it gets weak. #1 seems to behave more like I’m used to an analog radio behaving on weak signals. I do still notice a bit of selective fading (or whatever it is on a regular AM radio when your signal is still there but heavily distorted), but not much. Question – what feature on a radio would eliminate that? SSB? Sync? ECSS? Or something else? I’m guessing #2 and #3 are the Tecsuns, but I’m not sure. I have a few Tecsun DSP radios, just not those ones, and they share some similar characteristics, especially with #3, except I don’t hear any “soft muting” / audio/agc stepping/pumping in these recordings. Is #3 the PL-880? I’m guessing #1 is the Sony. I think 1 had the smoothest AGC, so it was most listenable, followed by 2 with more gain changes but less noise than 3. Nice idea Thomas to compare the same signal from the Balkans with four radios and well presented. I own only the Sony model so I think it sounds like the third recording which is really inferior. As far as I have read in various reviews the Sangean model needs a good external antenna to perform so this could be the radio omitted. I tend to enjoy the second recording (PL-660 ?) more than the first one which any way is quite close to it. I am about to order a Tecsun, but I have not decide yet between these two models. Probably the posts will help me to come to a conclusion. I liked #1 the best, and based upon the sound, I’d bet it was the PL-880 (it has a pretty distinctive sound compared to most SW receivers). #2 was a close second, and #3 was inferior to the other two. Since I’m in a betting mood, I think #3 was the Sony, which I always found to be overrated. Thanks for organizing this test; great idea! Thomas, I don’t know if you have put any thought into the analysis of the survey data, but I suggest you average the ranks for each receiver on each test, and present a final table for your readers to judge who won, overall. There are statistical tests for determining a final result, but in the end, presenting the data and letting people hear the recordings should allow people to make a “best fit” choice amoung receivers. I rank the samples as follows: #1, #2, and #3. The #1 sample was more tenacious in hanging on to an intelligible signal throughout the sample, while the #2 sample faded in and out rapidly, with brief times of unintelligibility. However when #2 pulled the signal in well, the speaker sounded better than #1, but I’d rather have consistent intelligibility. Sample #3 was far inferior to the other two. Great test. Liked 1, 2, 3 in that order. Bandwidths on 1 & 2 virtually identical to my ears. Found the enveloping AGC in #2 strange & fatiguing after a couple listens. Wider bandwidth on #3 only added noise here. What would #3 sound like in comparison w/ it’s bandwidth or hi-freqs knocked back one notch? Is that option available? Looking forward to more! I liked the way sample 1 sounded the best, very easy to listen to. Followed closely by sample 2 which had great audio but more pronounced fading. Sample 3 was a distant 3rd place. I liked sample 1 the best, better AGC control, sample 2 had better audio when the signal was stronger but it had funny audio affects when the signal faded, sample 3 was a failure in my book! Receiver one is the best over all for listening accuracy, two has better audio with more fidelity where three is the last as it is not able to handle weak signals with fade. I hope # 3 is not the Tecsun PL-880 or the unit left out of the recordings. I bought myself a Sangean 909x and a Tecsun Pl 660 for Christmas. The Tecsun consistently delivers better results with weak stations on an external long wire. Also, the SSB on the Tecsun is more sensitive than the Sangean, which,by the way, cost twice as much. I think 1 is best in overall quality. 1 is pl-880, 2 is 660 and 3 is 7600GR? Just received pl-880 yesterday so maybe it’s wishful thinking. Signal #1 was the best for me, followed closely by signal #2 for second place. #3 is a distant 3rd. I have a suspicion that the ATS-909X is the 4th receiver you left out, due to less sensitivity. The 909X is widely known to be only average on its whip for shortwave reception; however, it does very well with a passive external antenna and is less likely to overload like the others. One popular mod for the 909X is the addition of a 4:1 balun to achive a better impedance match between the whip and the RF input circuitry. The details on this are found on the ATS-909X Yahoo Group. I understood that the balun mod decreases FM sensitivity, which would make me think twice. I would use an external antenna instead. That’s true… I wasn’t thinking of the impact on FM reception as that’s not an interest of mine. There are other portables with impressive FM performance, such as most of the Tecsun models with the SiLabs DSP chips. #1 first, slightly better overall quality than #2; both significantly better than #3. Depends on the program and listening intent. For best voice intelligibility and listening via the radio’s own speaker, I choose #1 for its good signal to noise ratio and more even volume level, followed by #2 and last #3. However, for listening to low volume background music with the audio piped through a Pioneer A35 amp and Pioneer BS41 speakers I choose #3 for its high frequency audio content, followed by #1 and last #2. Was number 2 the Tecsun PL660? Because even though I dont own one yet,all reviews Ive read and seen on YouTube bring the 660 out on tops compared with many other receivers in use.Ive decided to buy one very soon! I live in Auckland NewZealand. Sample 3 was passable but 2 and 1 out did it by some margin. 1, 2 and then a distant 3rd is 3. I did my listening on an iPad sitting on the underground with heaps of commuter ambient noise using standard Apple earbuds. I wonder if I would rate the clips differently if I was at home listening via a speaker? The 2nd clip’s fluctuating volume was distracting when listening with the earbuds. Funny enough I was listening to Radio Romania’s DRM French broadcast (S9+20 here in Sydney) a bit earlier in the day, it wins hands down! I listened to these a couple of times, because in some aspects they were close, Number 1 was my pick. In my opinion there was better noise suppression and less fading. The AGC seemed to be better than the others. Number 2 was acceptable and number 3 didn’t come close to the others. Thanks Thomas! I too prefer #2! Lower background noise and program right up front. I agree with the 1,2,3 (in order of preference) rating. I definitely liked the audio and signal quality of sample # 1 the best. Number 2 was OK and number 3 wasn’t even comparable to the other two. I like number 2 and then 1. 3 is not in the mix as for as I am concerned. Same here, with 2 being the most pleasant to listen to. Maybe 1 had better AGC. 3 was clearly inferior. I feel that #1 was possibly the strongest but the audio was a little muddy or to bassy?? But it was the best over all for me..
First of all thanks for taking the time to make this post. I select recording 1 as it seems to have less fading. 2 is a close second and 3 is way behind. Which radio was not included? 909? Question: was synchronous detection used in any (or all of) of these clips? Or is that part of the test? No, I didn’t use synchronous detection because one of the four radios lacks it (the ATS-909X). I set all of the radios to their widest filter setting and with the gain up all of the way (“DX” instead of “Local” mode, for example). Antennas were fully extended and I tried to orient each radio on a table (I didn’t hold any of them) so that reception was optimal for each unit. No other radios were running while I made an individual recording; I simply cycled through them one at a time. I also made sure backlighting was off (not that any of these four have issues with noise off of the display). Were you thinking of doing another test with a medium to strong signal? Seems like a nice design for a radio “experiment” to me! Thanks for doing this. I see you have a new 909X, is that what prompted the post? Yes, it was the ATS-909X that gave me the reason to pit all four against each other. The 909X, by the way, is simply on loan from a friend who purchased it a few weeks ago. Great opportunity to play radio. 🙂 I really enjoy this sort of thing. Oo That’s no reason to disable the other radios? This test is not valid. To be clear: this particular test was only using AM mode (no sync) on weak signals because one of the radios lacks sync (909X). I did a separate test with recordings using sync, but only with the three that have a sync detector (PL880, PL660, 7600GR). It wouldn’t be comparing apples-to-apples if I used sync on some, but not all of the radios. I attempt to keep the playing field as level as possible. I think #1 was the most pleasant to listen to, followed closely by #2, and #3 a distant 3rd. I prefer the more active agc action in #1, even if some of the audio is filtered. #2 does have nice audio, but over a long listening session I think I would tire of the fluctuating volume. As simple as that,in one listening with eyes closed . Starting with favorite: 2, 1, 3. 2 has the best overall consistency and sound quality. 1 is very close, a little less consistent as the signal fades and regains. 3 has a nasty sound artifact in it, almost a hiss, but perhaps some digital processing noise. OK, now I can go read what everybody else had to say. I made sure to do it as a blind test. (did not read post or look at photos). Sample 2 had better audio quality, but sample 1 had much better AGC and did not have the annoying up and down volume changes that sample 2 did. It almost made sample 1 easier to listen to even though it was less audio quality and probably lower bandwidth. To me good AGC is one of the most important features on a radio. Can we have results pls.. thinking of buying a PL-880 and I’m hoping it’s fast AGC circuit is doing this nice stable ( yet slighlty muffled) reception. Sample 2 wins. Better audio and clarity. Sample 1 sounded rough, probably a narrower bandwidth, sample 3 was a dog. Then again, my decision could just be based upon an EQ curve that works for me.